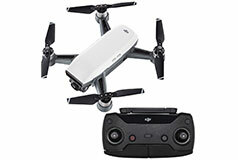 The Spark mini drone by DJI is designed to seize the moment. With features like intelligent flight control, incredible image quality, a powerful lens, and a mechanical gimbal, you will have amazingly clear images to share however you please. Easily control your Spark through the DJI Go 4 app for your smartphone and capture incredible images and video. Warranty does not cover damage caused by improper installation, incorrect use or operation.